AMPARA s.r.o. was established in 2005 as a successor company of the business operating as a physical entity, Mr. Pavel Žemlička. The company has been certified in compliance with ISO 9001:2016. 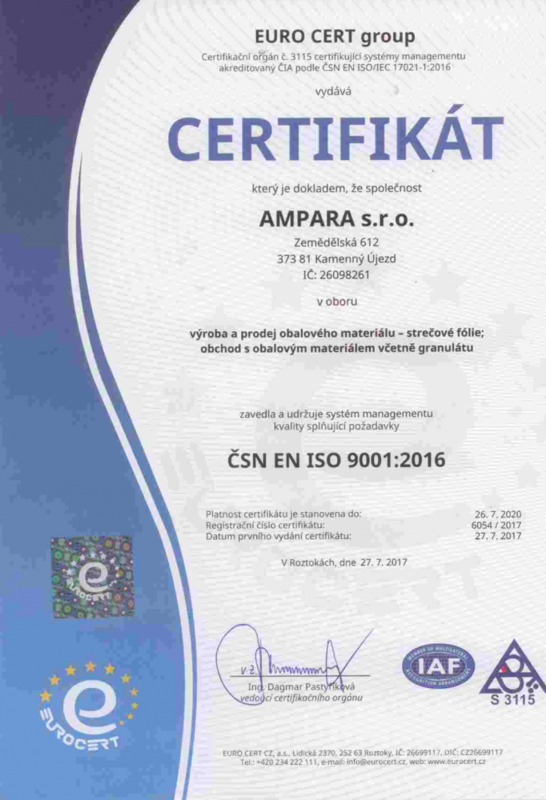 Over several years, AMPARA has become a strong and stable company that is currently one of the largest suppliers of packaging materials in the Czech Republic and its activities successfully penetrate foreign markets. The company AMPARA s.r.o. has four core business activities: secondary production and sale of stretch films, sale of other packaging materials, sale of materials for export packaging, and sale and service of packaging machines and tools. These activities are closely interconnected, giving AMPARA the competitive advantage of complex knowledge and experience within many related areas. We provide professional advice and a highly professional approach to our customers. Our company successfully cooperates with manufacturers of packaging materials, tools, and machines not only from Europe, but worldwide. These manufacturers provide exclusivity for distribution in the Czech Republic and simultaneously notify us about the latest products and materials that are developed and enter the market. This information and experience is passed on to our customers. Thanks to this information flow, we are ahead of our competitors and we are able to offer an innovative approach to packaging issues. Stretch foil, fixation straps, transport protection packaging, export packaging materials, other packaging materials, etc. strapping, wrapping, group packaging, cardboard box gluing, etc. The objective of our company is to provide the fast and quality servicing of packaging machines. In the area of service, we have more than 18 years of experience. What all do we offer our customers in the service area? Which branded machines and tools are we able to service? The objective of our company is to provide high quality and professional service under all circumstances. Společnost Ampara s.r.o. splňuje nejvyšší nároky na kvalitu nejen svých výrobků, ale i systému práace a v péči o své zaměstance. I díky tomuto přístupu se nám pravidelně daří obhajovat systém řízení dle standardů 9001. Pokud Vás zajímá ještě více, tak si projdětě náši politiku kvality.